Mort Kunstler Handsigned and Numbered Limited Edition Giclee on Canvas:"Lafayette with Washington at Morristown"
Edition: Artist Signed and Numbered, Limited Edition to 100/50/15/5. COA included. About the Art: Gen. George Washington made his headquarters in Morristown, New Jersey during the winter of 1779-80. During this time the Marquis de Lafayette returned to France after having served with distinction in the Continental Army since 1777. While in France he helped persuade Louis XVI and his ministers to support Washington's forces by sending an army of 6,000 soldiers. Dressed in his uniform of a Major General in the American Army, Lafayette arrived back in America in the spring of 1780 with a secret message for Washington from the King that he would receive help from France. As Spring arrived, the snow melted at Morristown. Washington emerged from the Ford Mansion, where he had spent the winter, and was warmly welcomed by his men. Equally warmly, he welcomed back the Marquis de Lafayette, who had spent several months in France. The previous autumn, while Lafayette was away, Washington had held a dinner for Anne-Cesar, chevalier de la Luzerne, the French minister to the United States. During the meal, Washington raised a glass of wine and drank to the health of Lafayette. He turned to Luzerne's secretary, Francois, marquis de Barbe-Marbois, and asked if he had seen Lafayette in France. Yes, Barbe-Marbois replied, and added that Lafayette had spoken of Washington with the "tenderest veneration." Hearing that his friend was well and honored by his countrymen, Washington "blushed like a fond father whose child is being praised." Barbe-Marbois remembered that "tears fell from his eyes, he clasped my hand, and could hardly utter the words: 'I do not know a nobler, finer soul, and I love him as my own son." 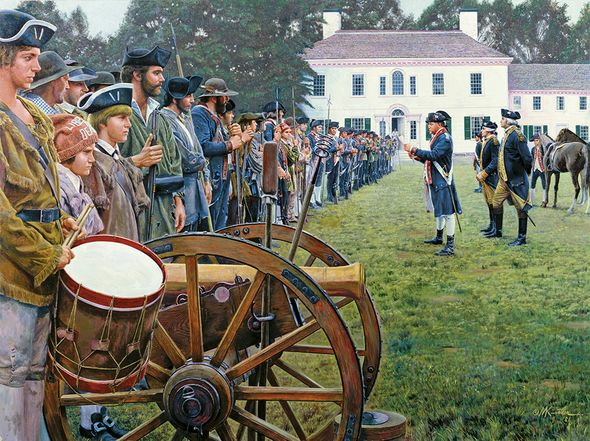 Lafayette's return from France and appearance side by side with Washington brought an air of festivity and expectancy to the soldiers gathered in Morristown. There was indeed good news. Lafayette had brought word that significant help - a French army, and possibly a fleet - was on the way. The war was about to enter its final phase.